One of the first stories of infatuation that I heard about the iPad game Kingdom Rush involved a man and a woman who were in love with each other and in love with Kingdom Rush. They had time to kill one day. I think it was because they were early for a movie. Or maybe they were early for a dinner. The point is that they didn't kill that time by talking or checking their cell phones or pondering the sounds of their city. They killed their time sitting just a few feet apart, each of them playing their own game of Kingdom Rush. Were I with them, I'd have likely done the same. Kingdom Rush is yet another tower defense game, a genre I've had a weakness for ever since I chose Desktop Tower Defense over BioShock as my 2007 game of the year. It is, like they all are, comprised of levels all based on different winding paths. 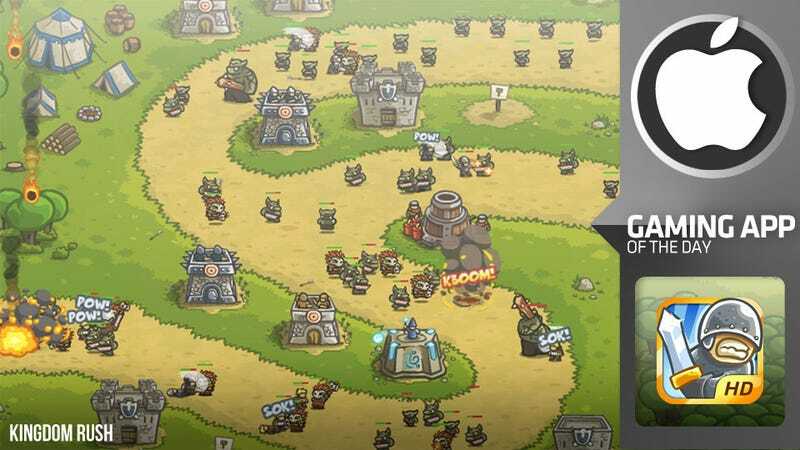 Each path in Kingdom Rush is made to be trampled by several waves of ogres, bats and other unpleasant personnel whose single goal is to reach the opposite end of the path and therefore make you lose. The player's job is to spend their fake money wisely and line the path with the right towers that can spill soldiers and toss arrows into the roadway to kill the bad guys before they achieve their goal. At first, Kingdom Rush appears to only be one of the prettiest tower defense games I've ever seen. Its knights and archers and their stone towers all look like excellent notebook doodles. The game's bad guys are tiny, cute and designed with a clarity that makes it a cinch to distinguish the armored jerks who need to be dispatched by my mage towers from the furry foes whose fate must be delivered by my archers. At second, Kingdom Rush turns out to be a tower defense meal that is served with extra dessert. The treat is the end-game of each stage. In many tower defense games, skilled play during a stage will earn you money and other resources that let you level up your towers. By the final waves of the stage in an average tower defense game, you're enjoy the pleasure of using maxed-out rapid-fire, electricity-spitting super-towers to squash your waves of enemies. In Kingdom Rush that satisfying phase of a tower defense stage is merely the halfway point to accessing a bounty of fantastic uber-upgrades. You see, you level up your archer tower four times to get a magnificent tree fort of a structure, but then you can spend big on magic spells that will enhance the arrows fired from the fort—specifically, you can spend on a poison spell and a vine-spewing trap spell and level both of those spells up three times. When you start the next stage of Kingdom Rush, as is the case with many tower defense games, you're back to building a level one tower. You're hoping to ride that wave of upgrades and uber-upgrades again. But you may also benefit from some permanent perks that you can buy in a shop—perks that will let you rain down molten fires on enemies or make your archers shoot further. These are gained by spending stars earned by skill play. In the early stages, Kingdom Rush seems simply too easy for a veteran tower defense player like me, but alternate modes for each stage add the challenge I wanted. I don't know if there is a similarly satisfying toggle to rid the game of its main annoyance: the characters' shouting of corny one-liners from movies like Braveheart that might have amused the designers the first time they thought of them but made me groan by the second time I heard them. Should you too someday have time to kill before a movie or dinner, and if you have an iPad or are near something that runs Flash in a web browser, do spend that time playing Kingdom Rush. For some couples, it's more satisfying than talking. For me, it's the best tower defense game I've played in a while.